It may be only 29 degrees Fahrenheit as I type these words in front of the fireplace here in the Northeast, but the cold is just a little bit easier to take considering the fact that we’ve just returned from sailing with good friends from Grenada up to St Lucia. We even were able to avoid the whole Christmas industrial complex here in the States and celebrate Christmas morning anchored peacefully off Petit St. Vincent in the southernmost point of the Grenadines. Ahhh, what’s not to love about a Caribbean Christmas? We indulged in swimming off the sterns in warm blue water, and walking on white sand beaches. Jack Frost was nowhere to be found, and you know what? We didn’t miss him at all. 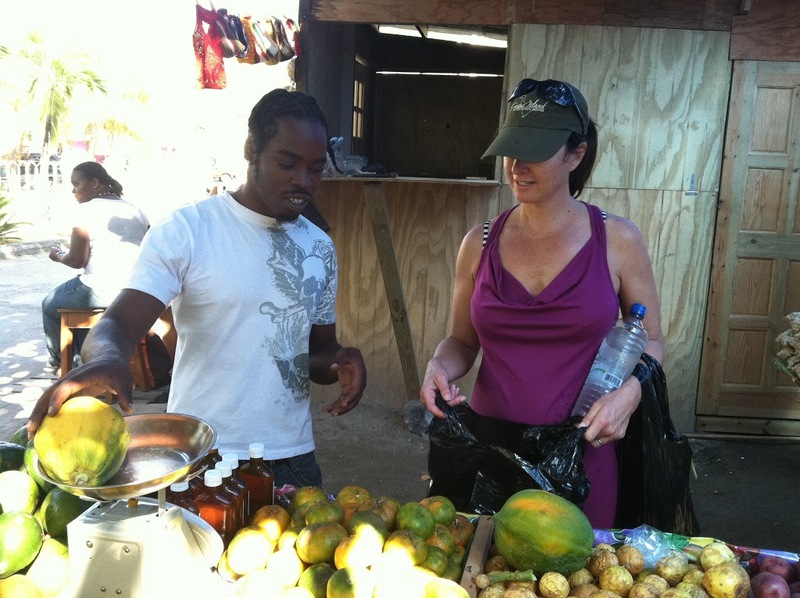 Our trip started by taking an island tour of Grenada on the day before Christmas. 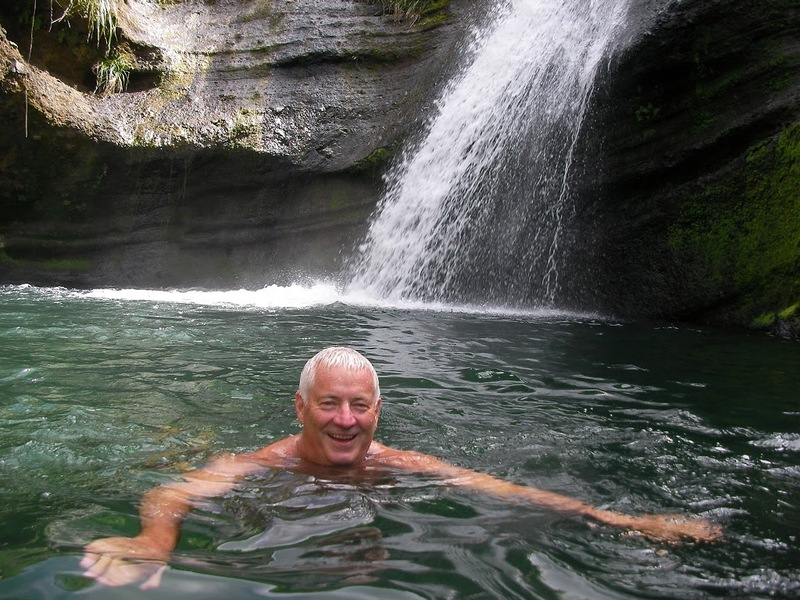 Our first stop was this fantastic waterfall-fed swimming hole that John is obviously enjoying. Grenada and the other Windward Islands that form the southern end of the island chain are so much more lush than the Leeward Islands to the north. Ample fresh water makes Grenada—the “Spice Island”—the ideal place to grow nutmeg and other spices. There’s something timeless about this shot. I snapped this shot during our tour of a nutmeg-processing house in the busy fishing village of Gouyave on the west coast of the island. A good chunk of the world’s nutmeg still comes from Grenada even though production has decreased significantly in recent years due to many of the trees on the island being damaged in hurricanes. It was a fascinating place that seemed to just breathe history. 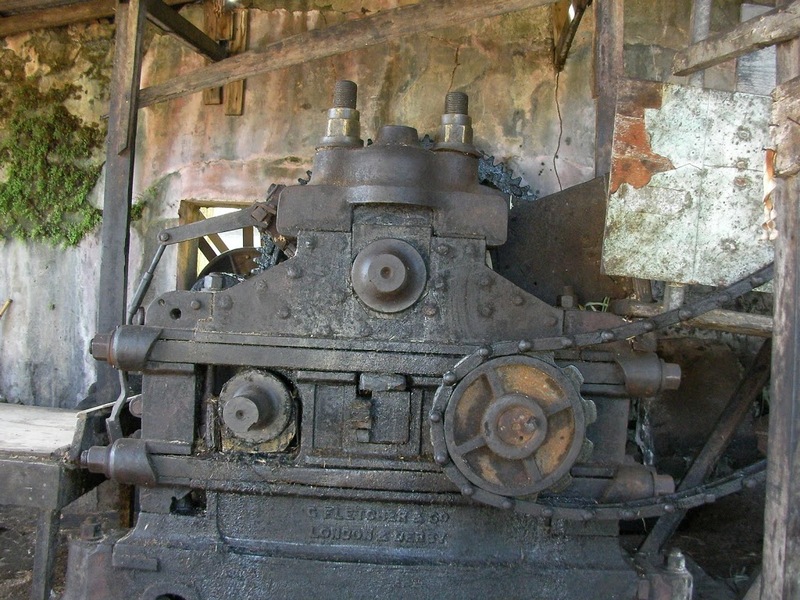 We all could sense that the process of drying and getting the nutmeg ready to be shipped all over the world had gone on unchanged for generations. And then we went to the rum distillery that’s literally been turning sugar cane into rum since 1783. 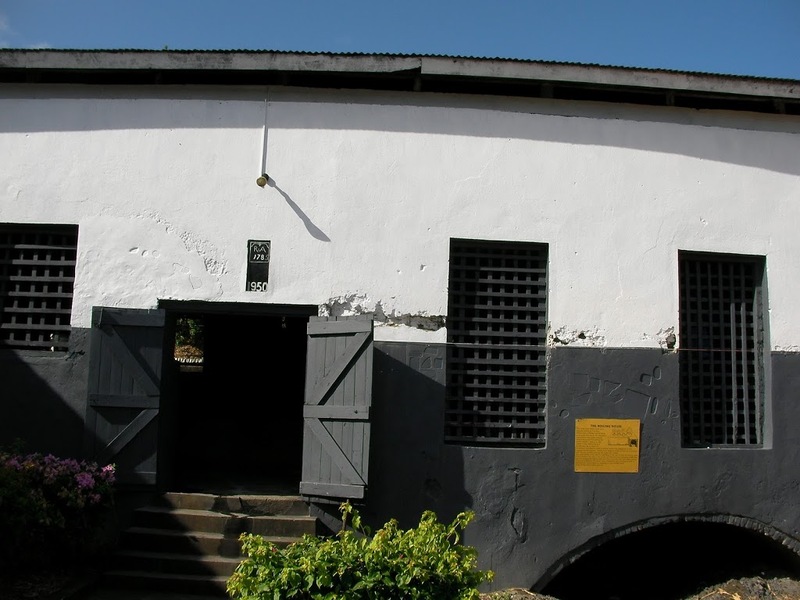 River Antoine Rum has been produced on this site since 1785. 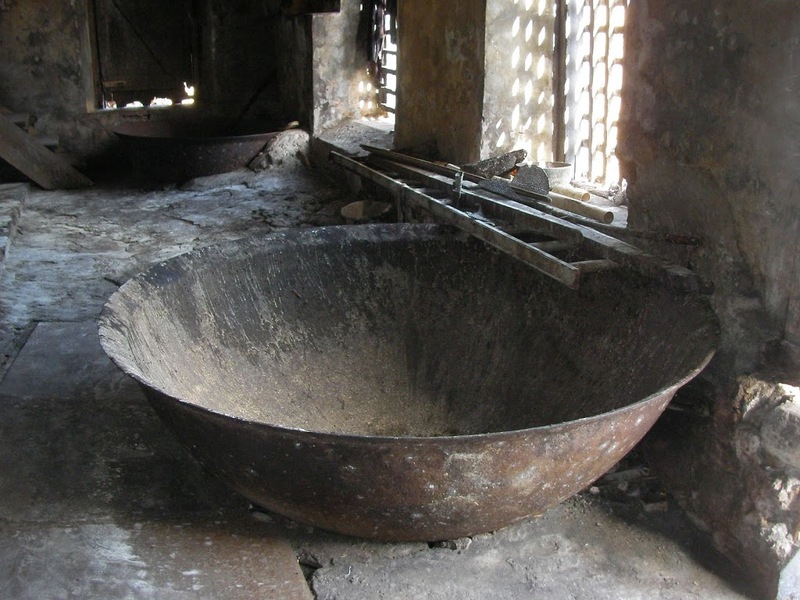 Crazy to realize that sugar cane has been boiled in these vats to make rum since the late 1700s. But honestly, it looked (and smelled) exactly like that. I thought rum distilling would have been, ummm, cleaner. You could feel the history in this iron cane presser (powered by a water wheel, hence the “River Antoine” moniker) that’d been brought over on a British merchant ship in the late 1700s. And it’s still in use today! Talk about built to last. 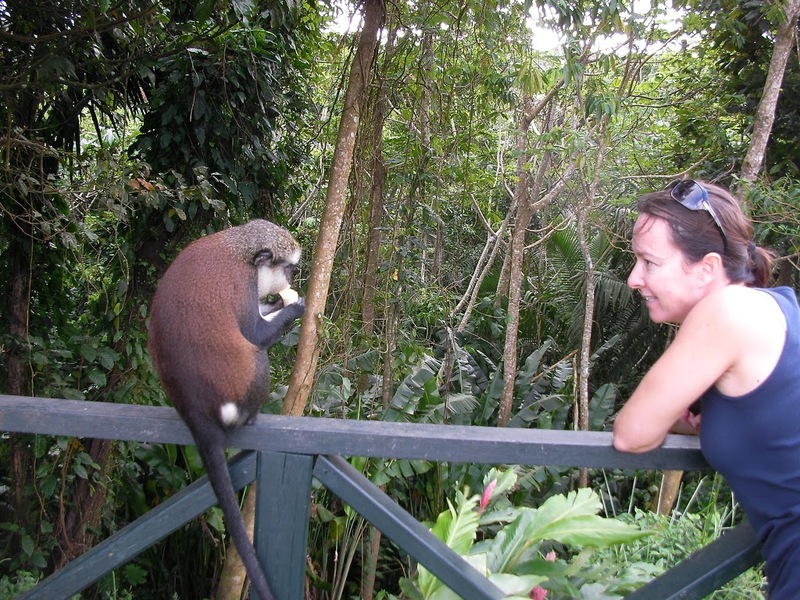 On our way back to the boat in St. George’s Harbour on the southern end of the island, we stopped in the rain forest where we met some friendly—hungry—monkeys. We didn’t want to get too close, but Caroline was the bravest and offered up the bananas that our savvy driver picked up for us on the way. These monkeys knew a good thing when they saw it. Our little friend here almost couldn’t finish his banana and reminded Caroline a little bit of our cute cats back home. We were tired and happy when we returned in time to celebrate a quiet Christmas Eve on the boat. John and Caroline investigated midnight Mass at the cathedral in St. George’s, while Caroline and I tried to catch up on sleep. We’d only been in the tropical heat for hours at that point, plus we wanted to be fully rested before heading out on the 30-mile trip north up to Petit St. Vincent and Union Island in the Grenadines. 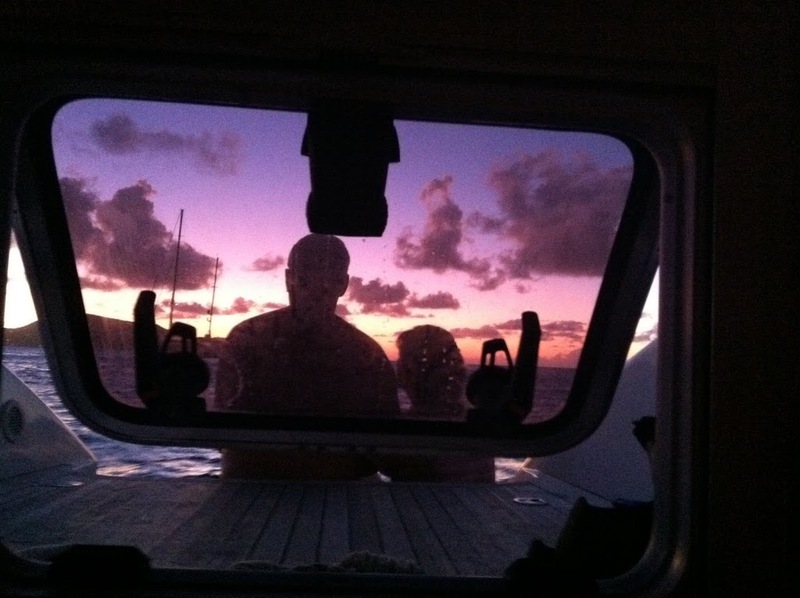 I snapped this shot of our hosts John and Caroline as the sun set on a fantastic Christmas day in the Tropics. 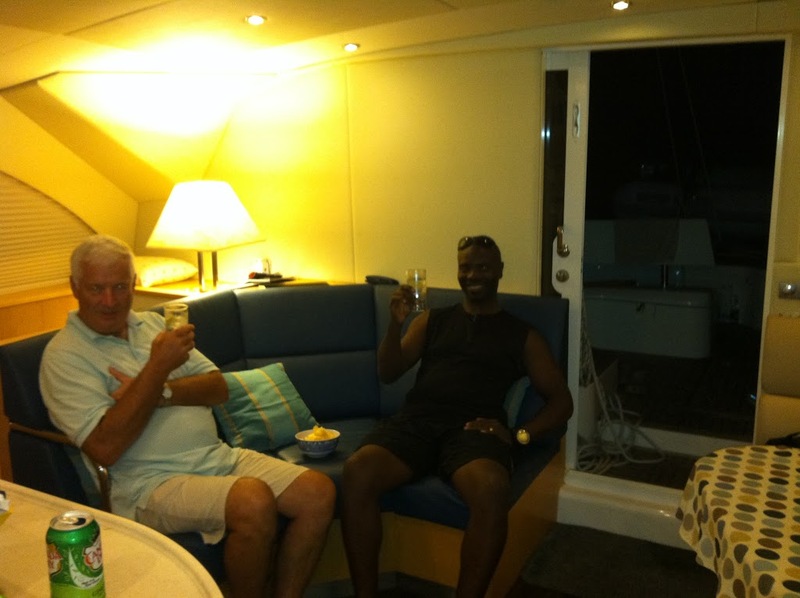 After a rocking passage from Grenada, we settled right in to the anchorage off Petit St. Vincent. Ahhh, it felt so good to finally be swimming in the blue water off the back of the boat. We even made an amphibious landing on the beach and just let the gentle waves slowly wash the stress away. We were up early the next morning. Off to the Tobago Cays. The Tobago Cays lived up to their reputation as one of the classic Caribbean anchorages. And while the crowd of boats that had the same idea of spending the holidays there that we did didn’t really bother me, I couldn’t help but think that it’d probably be a bit more chill there as the season winds down. (The boat boys were polite but man, they sure were persistent.) But all in all it was fabulous—and what’s not to love about surreally turquoise-blue water and an anchorage behind a ring of reef? It was a Joyuex Noel indeed. But we didn’t dally for too long there. We had to cover some miles if we were to get to St. Lucia on time. So, poor us, we were off for Mustique (one of the most exclusive islands in the Caribbean) in the morning. After the more rough and tumble streets of Grenada and Union Islands, Mustique is almost too perfect. But can anything really be too perfect? 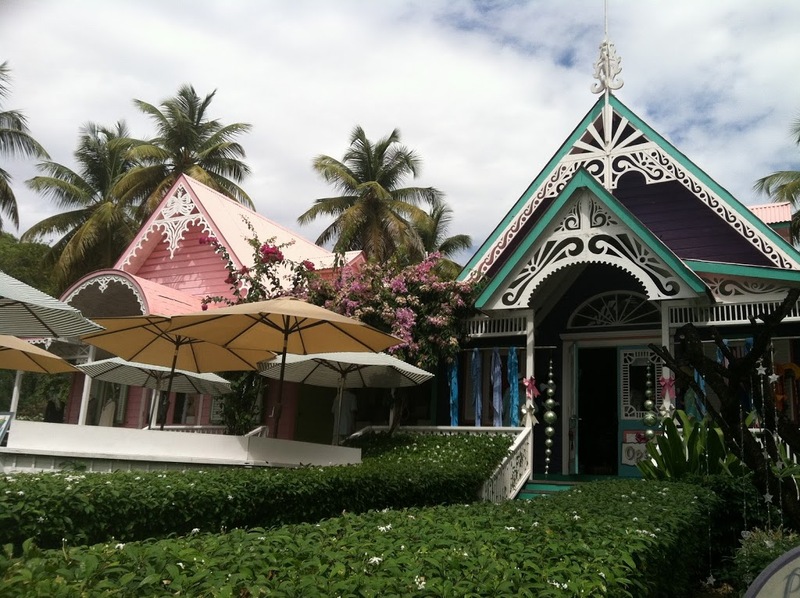 We did a quick spin through “town” and shopped in the uber-exclusive shops pictured above, and went for a quick snorkel in the southern end of Britannia Bay before continuing our progress north to sweet, Sweet Bequia. The fruit guys helped us feel so welcome. 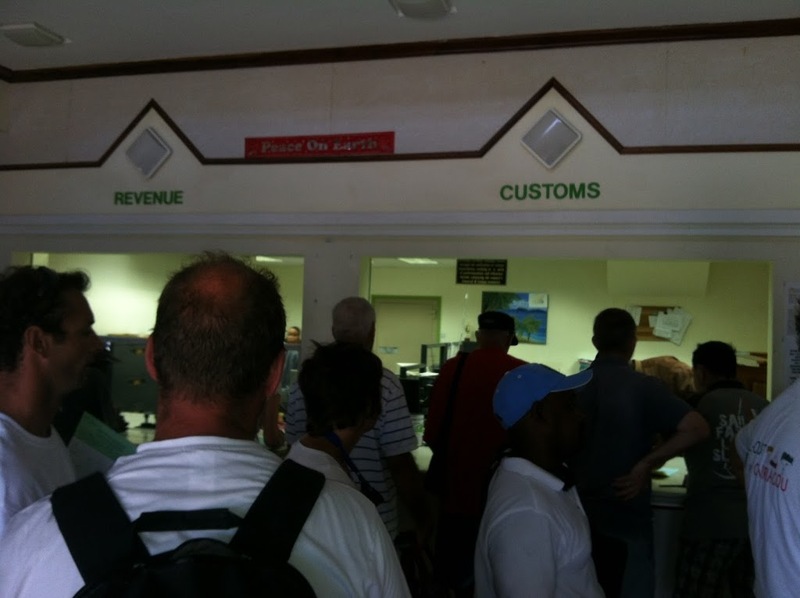 While John and Caroline cleared in at the Bequia customs office, it’d been two days since we left Grenada and we had to clear into the country of St. Vincent and the Grenadines. It was crowded, the line didn’t move too fast, and ummm, there was no AC in there. 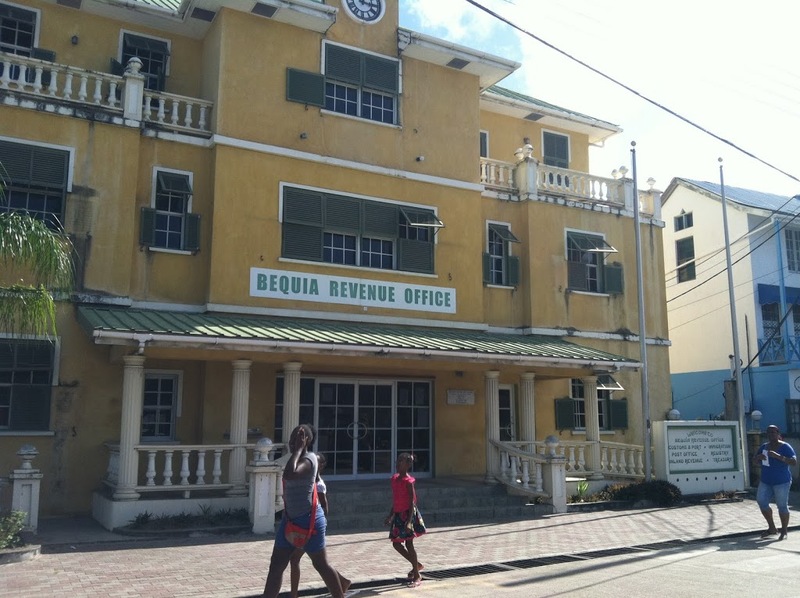 Caroline and I definitely got the better duty in Bequia, and then we were off again to explore more of St. Vincent. We happened upon this cool, little bay on St. Vincent’s southern tip. The perfect lunch spot and we had it all to ourselves. 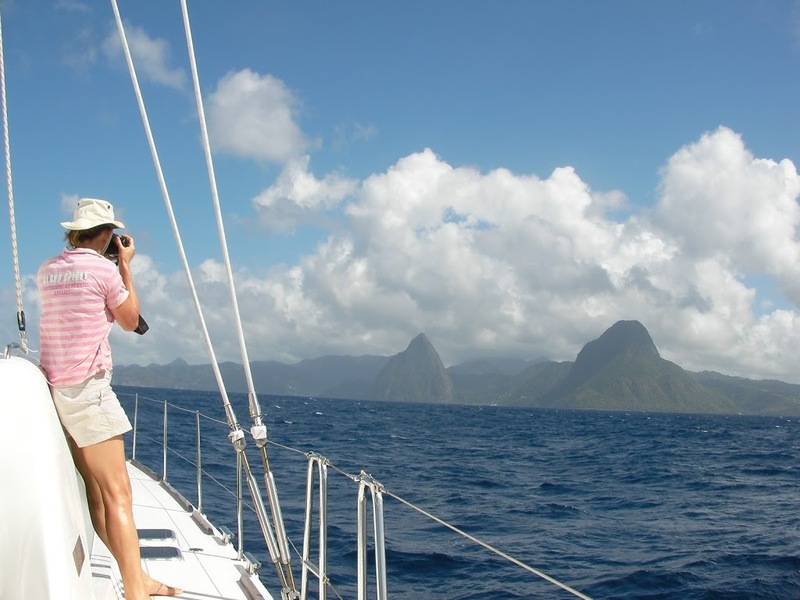 But we really wanted to get further north to be well poised for our passage over to St. Lucia. And this is where we found an anchorage that had a distinct “South Pacific” feel. It’s a small deep bay that required us to tie a stern line up to a palm tree on the beach. Of course the ubiquitous boat boys were there to help us get our line ashore. Everything about this place—the light, the sounds of the birds and the peepers on shore, the clouds in the sky—was special. We’d have liked to spend a bit more time here but we were up and off by 0630 the next morning. The Pitons make it really easy to make landfall in St. Lucia. We saw these green skyscrapers from miles away. We loved St Lucia. We grabbed a mooring at the base of the Petit Piton and luckily, Jason (pictured below) came to collect our fee to help protect the coral in the park. The mooring fee was well worth it because the money goes to maintaining the moorings and protecting the coral, but more importantly, we met Jason. He not only sincerely welcomed us to St. Lucia, he picked us up after dinner and took us to swim in the volcano on the back side of the Pitons. How cool it that? We were so grateful to get a decidedly non-tourist swim in the mineral-laden hot springs and we also learned all about Jason and his family. It was fun and we made a friend. What a special night. Here’s John and Jason after our nighttime dip under the stars in the volcano. What a wonderful host he was. We want to pay his kindness forward as soon as we can. 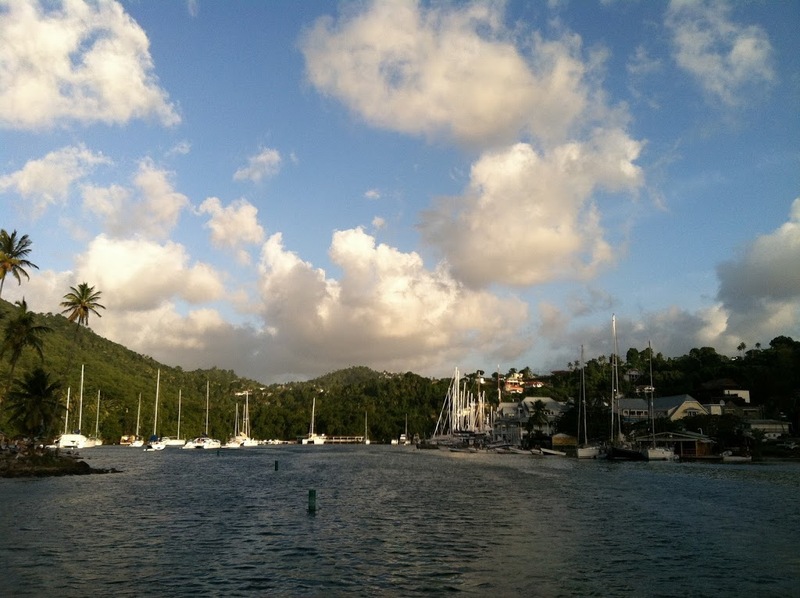 Marigot has fuel, provisions, wifi, several good restaurants and is also home to the Moorings charter base. And it was fitting that the last boat boy visit was this guy. 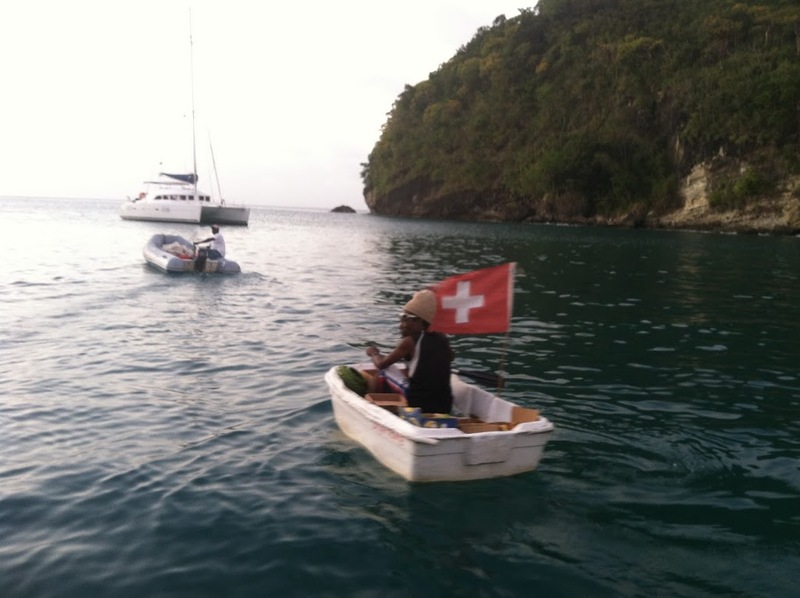 His boat was the smallest, he rowed instead of using an outboard, and he flew the Swiss flag. Priceless. We love the Windwards and we can’t wait to go back. And then sadly, we only had one night left. We were off to Marigot Bay. After pulling up to the fuel dock we got the boat settled back out into the anchorage the following evening. Then it was almost time to say goodbye to John and Caroline. They continued on up to Martinique while we, sadly, had to return home to work and winter. But we know we’ll be back. The Windwards are just too lush and sweet. I’m in love. 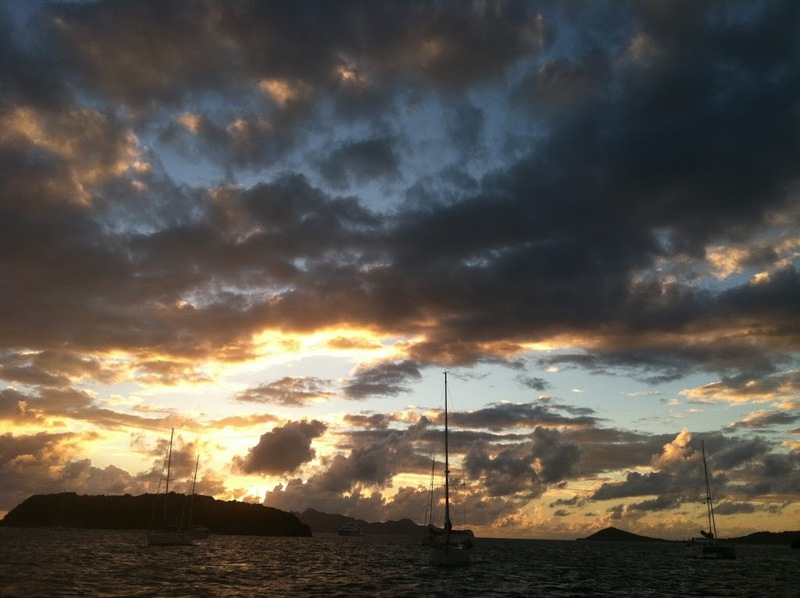 Previous articleWhat’s it really like to sail the Caribbean 1500?